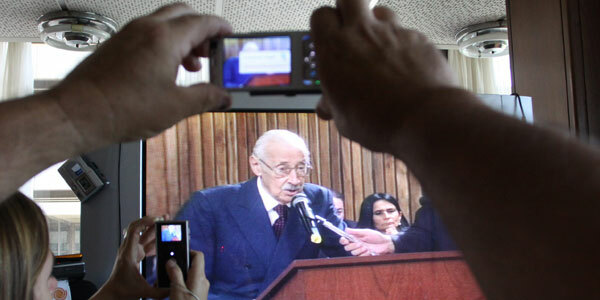 Thus spake defiant former Argentine dictator Jorge Videla (above), before a national court. Many of his 28 codefendants -- all members of the brutal military regime that ruled in the 1970s and 1980s --delivered similarly unrepentant speeches. But the court in Córdoba had the final word, imposing sentences of life in prison for crimes against humanity. (credit for EFE photo) Yesterday's relegation of once-powerful men to una cárcel común ("a common prison") was the latest in a string of national prosecutions in Argentina; IntLawGrrls' prior posts on this accountability process are available here. Add to that, with regard to Chile, that on December 17 a French court convicted in absentia 13 officials who served under Pinochet, including Manuel Contreras, former head of the secret police, for their roles in the disappearance of 4 French citizens in the 1970s. Contreras is one of two to receive life sentences, but he's currently in jail in Chile. See http://tinyurl.com/37jjo4b for more details.